I got up at 3:25 am to use the restroom and found my energy bottomed out. I felt hot, flushed, and on the verge of passing out. I had to lie down immediately. When I felt a little more stable, I made it to the fridge to eat some ice, which helped. The ratios of lemon juice and maple syrup were likely off yesterday and the day before. It would also explain why some of my mixes have been much darker than normal…and I thought it was due to the dark syrup! I called myself eyeballing how much lemon juice it takes to make three batches in one quart — six tablespoons, which comes halfway up the first line on my Mason jar, so 2 ounces. And the same amount for the syrup. I’m going right back to measuring! Or perhaps I just got too hot. My heat was on at least 80 degrees. I felt completely fine when I got up for the day around 7 am. 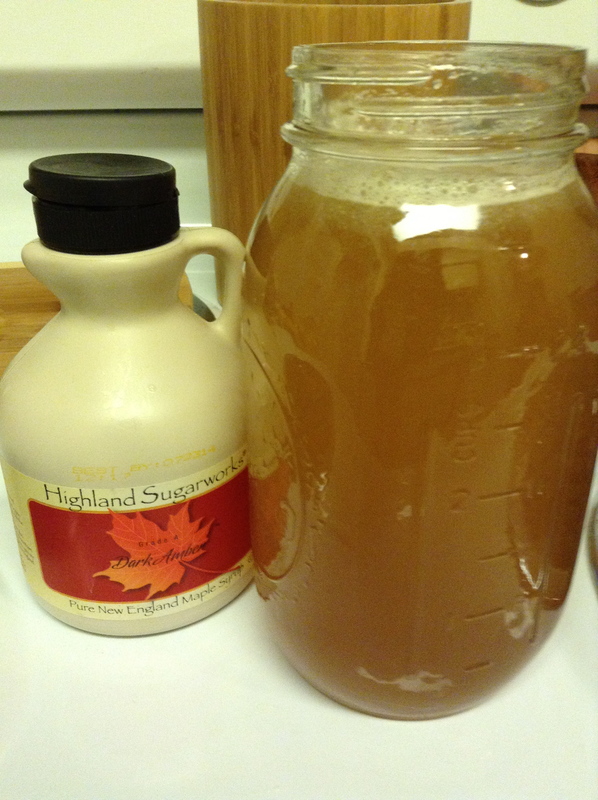 A quart from yesterday…a little too much syrup! I was kinda surprised I lost two whole pounds since yesterday morning. The massage and sauna likely contributed. I’m drinking the laxative tea first thing again, since I’m going to a special fellowship service to commemorate Master Yogananda’s birthday later this morning. The herb tea works much more slowly than the salt water flush. At this point, I’m going back and forth as to how I want to break this cleanse — do the two and a third days of orange juice (OJ) as recommended OR just have a smoothie Tuesday morning. I wonder if Burroughs knew of smoothies when he wrote the Master Cleanser book? A smoothie seems to me to be easing back into eating, too. It is also how I broke my last fast. One minute I think “I’ve done ten days, what’s two more?”, and the next minute, I just want to get on with it!